Always an important fixture in Waitaki’s calendar, this years show is already promising to be one of the busiest yet. The company will again have a focus on PernaTec, greenshell mussel oil, CassiPure, high anthocyanin blackcurrant extract and ActiPhen, kiwifruit concentrate powder. There are also a number of new opportunities to discuss around a range of fruit and vegetable based extracts. These have been made possible through the recent commissioning of an advanced technology extraction plant and expanded freeze drying capacity. “The demand for quality ingredients, particularly from botanical sources has driven significant expansion of the Companies processing facilities. This demand has also led us to explore a range of new raw material sources. 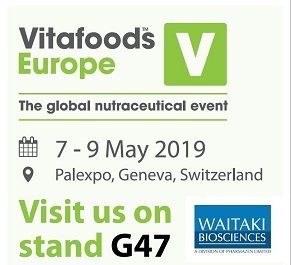 We are looking forward to discussing these opportunities with our customers at VitaFoods” says company CEO, Craig McIntosh. While there are always new opportunities to discuss, Waitaki’s established product range provide a solid portfolio of high quality ingredients. These ingredients target bone and joint health, anti-inflammatory applications, immune health, digestive health, companion and performance animal nutrition and anti-aging applications. 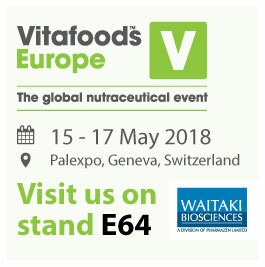 Waitaki will be exhibiting at Vitafoods Europe from 15th -17th May. Visit us at stand E64.